Hi everyone! I hope you are having a great summer so far! We are melting in the Texas heat, lol! Today, I have two scrapbook layouts featuring my favorite scrapbook brand, Dear Lizzy by American Crafts. The newest line from Dear Lizzy is called Fine and Dandy, and I love it! Love the colors, the birthday and animal themes, and the gold accents. *BTW, this post is not sponsored, I just really love the line. First up is “Lucky Ducky.” At my youngest’s preschool, they celebrated summer birthdays at the end of the year, and my little July gal was over the moon with joy. She got to wear a birthday crown and be the lucky ducky (class helper and line leader) all day. She wanted a cookie cake with a cute duckie, since their class mascot is a duck, and it was a real hit with the kids and the teachers. Woo hoo, no leftovers! I have done circle layouts like this many times before, but since I have a die cut machine and circle dies, this layout was a breeze. Before I had a die cutting machine, I had just a few circle punches, and for the rest, I would trace different sized circles using cups, coins, paint bottles, etc., then cut them out by hand. Next up is “TOOTH omg.” My older daughter fell in the cafeteria (they were having field day activities in there since it was raining), and the nurse called for me to pick her up. When I got to the nurses office, my jaw dropped…her tooth was half gone! We scrambled to find a dentist office open on a Friday afternoon (Did you know most dentists close at 2:00 pm on Fridays? I didn’t. ), but we got it temporarily fixed. Thank goodness, because her dance recital was the next weekend. Whew! For this layout, I wanted giant letters cut out from the gorgeous patterned paper, all found in the 6×6 Dear Lizzy Fine and Dandy paper pad. On my computer in word, I typed out tooth in a huge font. I printed it out, cut out the letters, and traced them on the patterned paper. Then, I cut out the letters on the patterned paper and attached them to white card stock, and sewed them down for more interest. I then attached the whole card stock to my layout using foam tape to make it a focal point. This was a simple layout focusing on the story, the photos and the giant letters. I love how it turned out! Thanks for stopping by, and happy Thursday! First up, a congrats shaker card. I recently shot newborn pictures for a sweet couple. 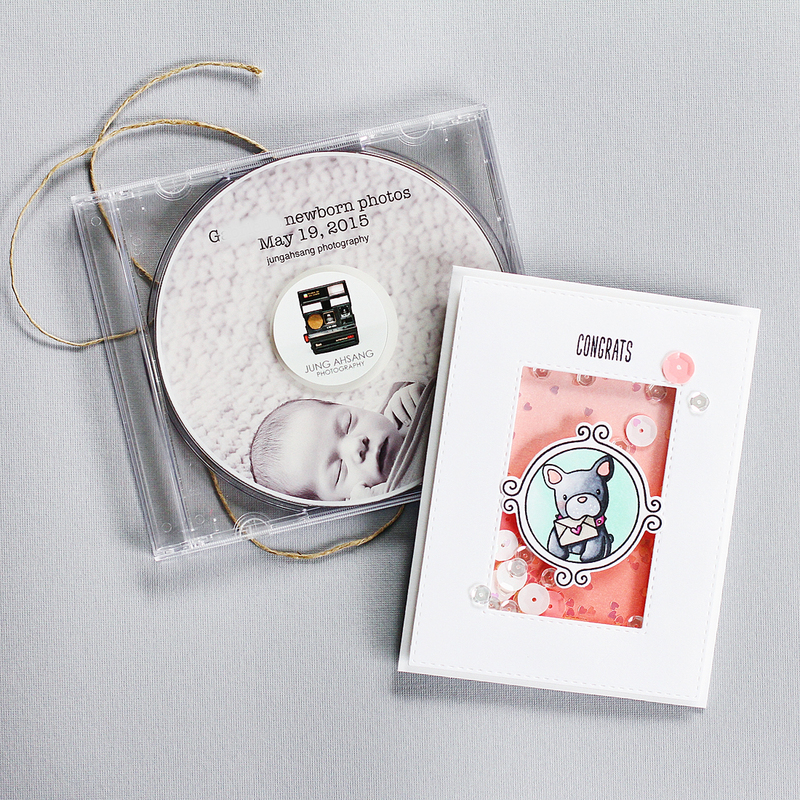 Along with their digital images, I made a cute card congratulating them on their beautiful baby girl. 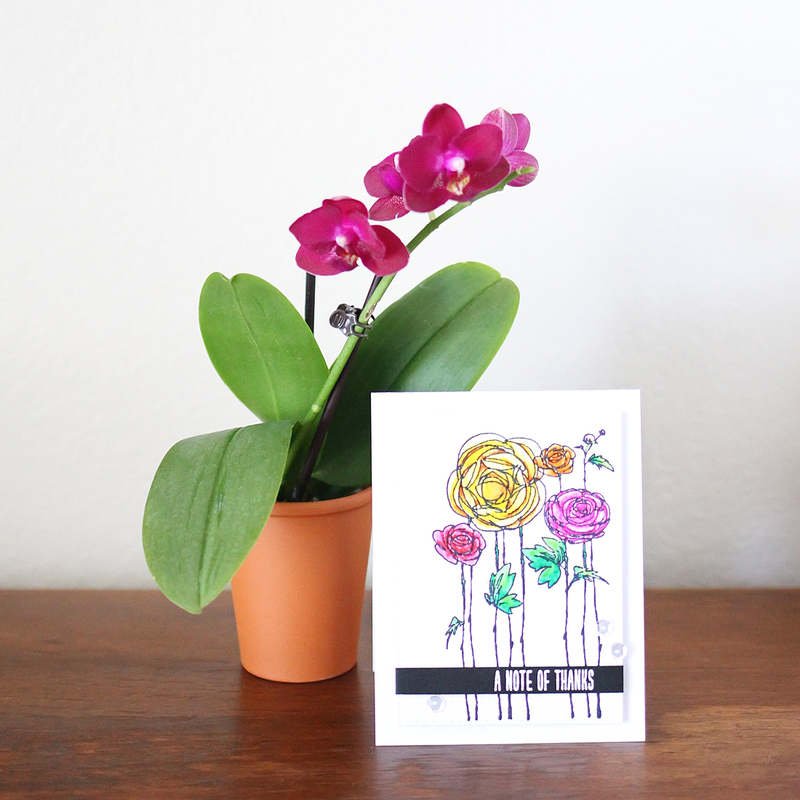 Last, is a thank you card and mini orchid for a last day of school teacher gift. This was for my 3rd grader’s teacher, and the theme for their class gift was grow. The class gift was a decorated plant pot with all the students thumb prints & a gift card. My daughter wanted to give something to her teacher in addition to the class gift, so when I saw these mini orchids at the store, I thought it’d be perfect. Thanks for dropping by! Sorry if you’re tired of these hand made cards posts, but I have just been loving them! 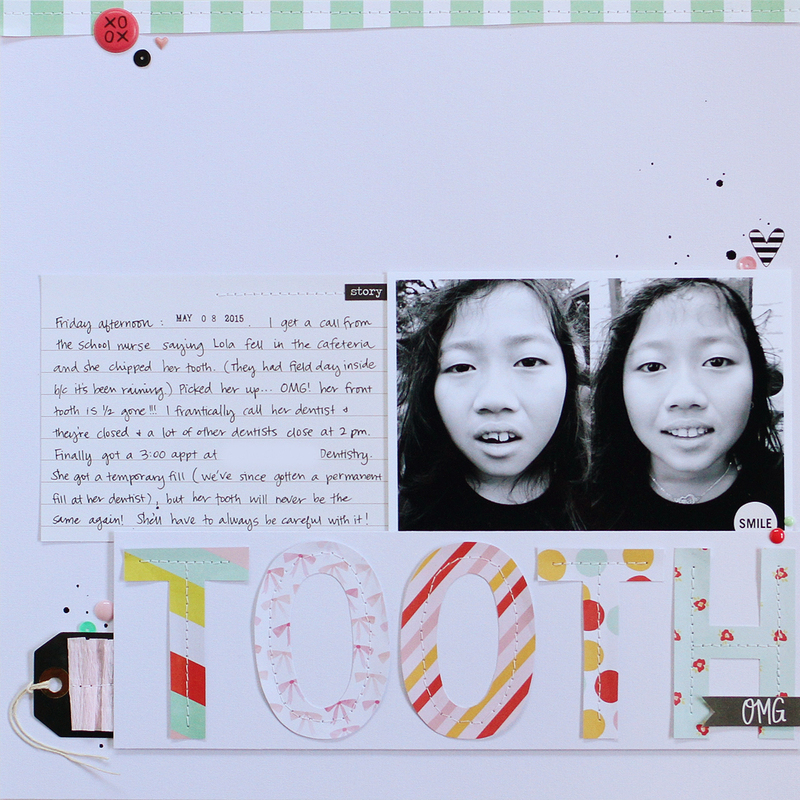 I have been scrapbooking also, and I should have a scrapbook layout post up soon! Hello! I created a card for Pretty Pink Posh’s water color blog hop & The Daily Marker’s 30 day coloring challenge. 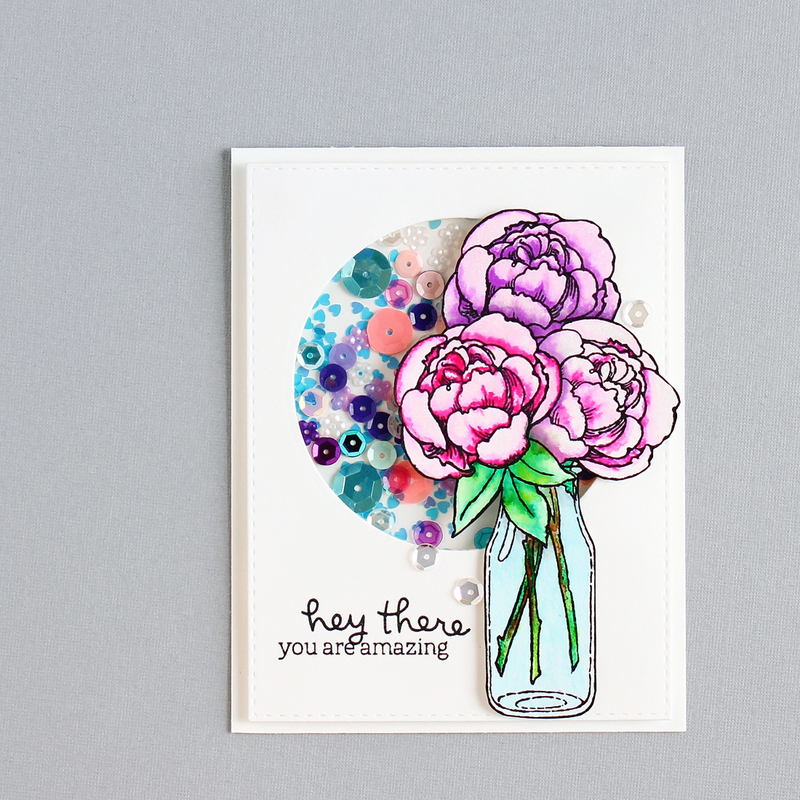 For my entry, I created a multi-purpose card featuring my favorite flowers: peonies. I am not comfortable with my watercoloring skills, but I’m practicing, and slowly showing improvement. I used the Kuretake ZIG clean color real brush pens to water color my stamped image. 1. I stamped my image on a piece of watercolor paper using waterproof black ink. I had to do a lot of masking for the flowers and glass bottle. 2. I water colored the image using some clean color real brush pens. I just kept building up the color until I was happy. 3. After drying the image, I used my wink of stella pen to give the petals a little sparkle, and then fussy cut around the flowers and bottle. I took a black marker around the cut edge to give it a more finished appearance. 4. I cut out a piece of white card stock using a stitched rectangle die. Then, I cut out a circle in the rectangle that I just cut. On the back of that, I adhered a piece of acetate. On the front, I stamped my sentiment using two different stamp sets. 5. On the back of the rectangle, I adhered foam tape around the circle, carefully making sure that I didn’t leave any spaces. (Don’t want any sequins to fall out!) I went ahead and double layered the foam tape to give the sequins plenty of room to shake around. 6. I cut and scored another piece of card stock to serve as my card base. In the center of my card base, I piled a lot of different sequins, keeping in mind the colors of my peonies and bottle. 7. I adhered the rectangle card stock to the card base, making sure none of the sequins escaped. 8. I adhered the peonies & bottle image to the front of the rectangle & window using more foam tape for extra dimension. 9. For the finishing touch, I added just a few sequins to the front of the card. 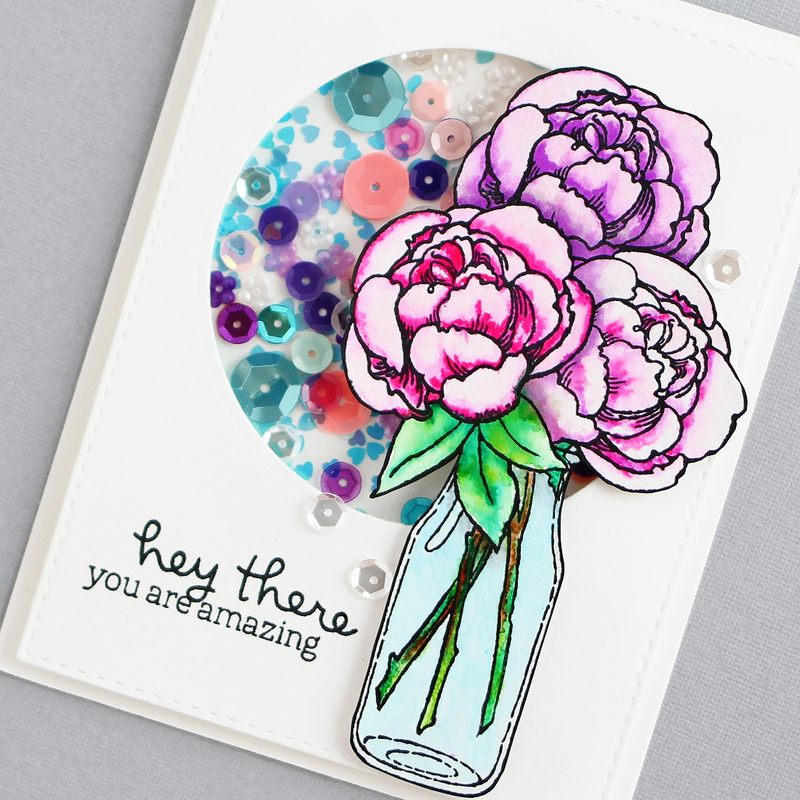 I linked in this card for the water color blog hop! I hope you’ll join in the hop as well! This card also serves as my day 5 for The Daily Marker’s 30 day coloring challenge! You can join in at any time! It’s now June, so I figured that I would share with you what I’ve been loving in the month of May. May is a super busy month for us, with dance rehearsals and recitals, and winding down toward the end of the school year for both the girls…but I did have some favorites. 1. Lawn Fawn Flirty Frames stamp set with the matching lawn cuts (dies). 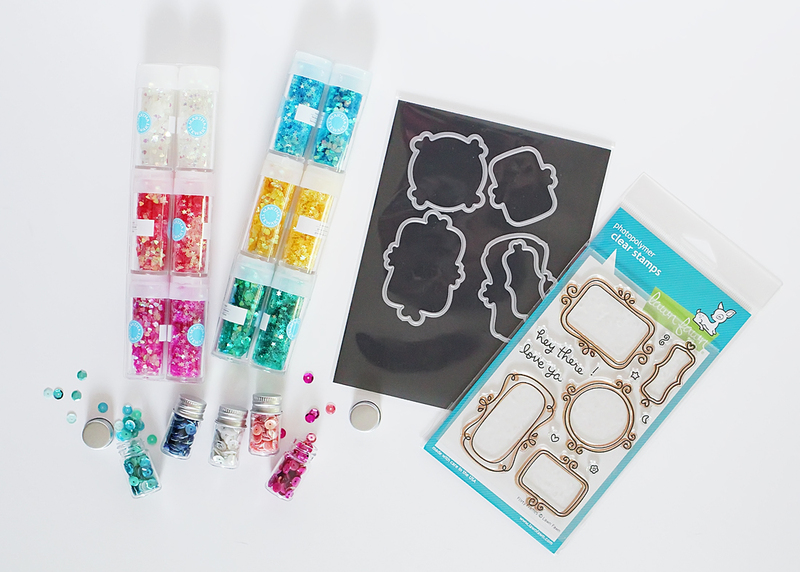 I usually don’t buy the matching dies; I am perfectly fine with fussy cutting, and dies can get expensive, but there are just some stamps that look better with them, and these flirty frames dies cut out the stamps perfectly. I will be posting some projects that I’ve used this set for on my blog soon. 1. 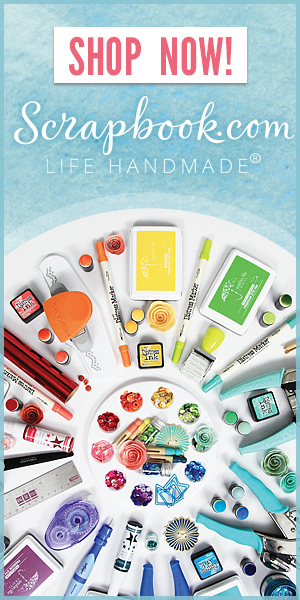 Colourpop Cosmetics: I got into this brand, because I was looking for affordable, long-wearing, cream makeup for my girls recital makeup. Quickly, the products became a favorite for me. They have an interesting creamy/ gel-like texture, and lasts a really long time. 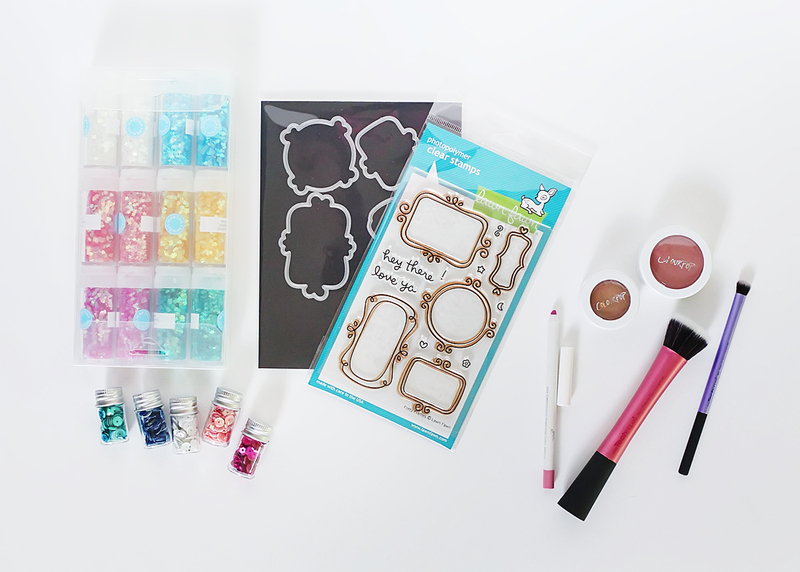 Another big perk: affordability; each item is either $5 or $8, unless you get a set. *Colourpop blush in “between the sheets.” This shade is a very wearable, everyday mauve-pink. *Colourpop eyeshadow in ” Desert.” This is a really nice crease color. *Coloupop lipliner in “pony.” Love this color; bright, cool toned, purple-pink. It’s so creamy, I use it as a lipstick. 2. Real Techniques makeup brushes: These makeup brushes are my all time favorite brand. They’re super soft, very affordable, easy to wash, and don’t shed. I usually get them at Ulta using a coupon, but I have seen them at Wal-Mart and Kohl’s recently as well. They are in my favorites this month, because of Colourpop. Since the Colourpop eyeshadow & blush are a cream texture, a synthetic makeup brush works best. I have been using the “stippling brush” for the blush, and the “shading brush” for the eyeshadow. 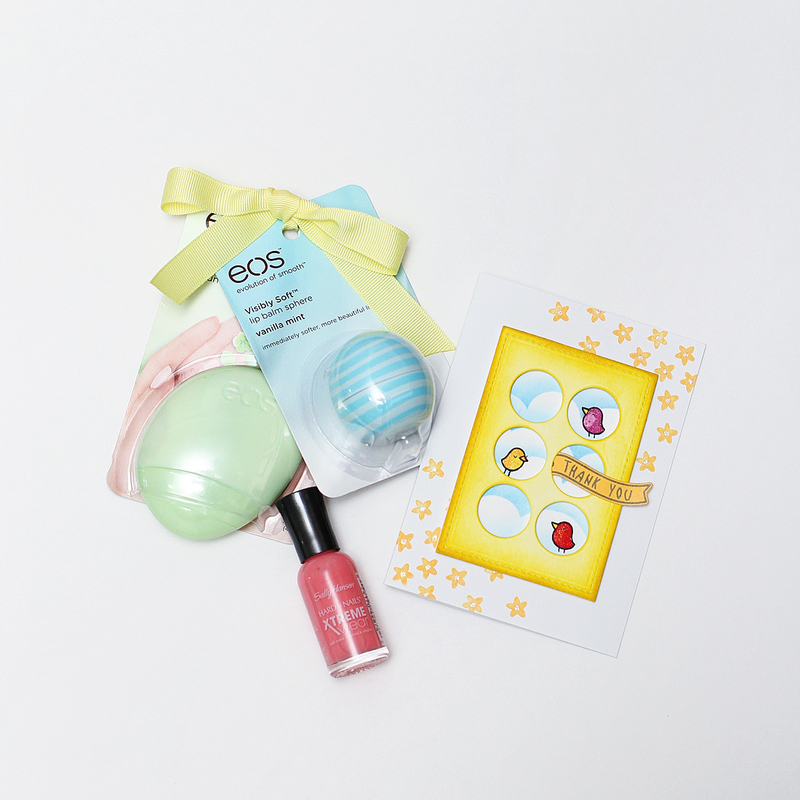 That’s my May faves! What are some of your favorites?